H Legs are made from 1 1/2" square steel tubing with 1/2" solid steel bar across lower leg. Mounting bracket is 3" wide with eight 1/4" holes for your fasteners. Bottom of legs have plastic inserts to protect floors. Extremely sturdy legs. 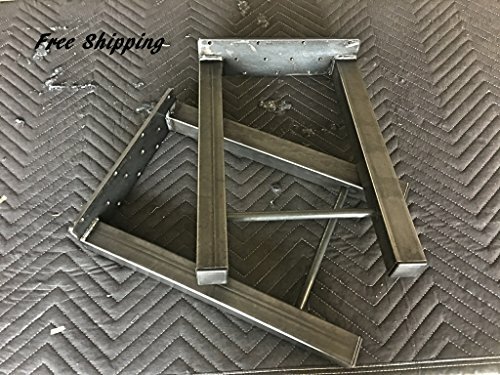 If you order Unfinished Raw Steel legs you need to consider how you are going to care for your legs. Raw steel will rust. There are several solutions that you can consider. If you want them to remain in the natural state you can rub beeswax or furniture polish (nothing acidic i.e. lemon as this enhances rusting) on them or powder coat them clear. You can also paint them with a rust resistant product. Our shop offers powder coating the colors are Clear, Matte Black, Satin Black, Glossy Black, Matte Brown, Glossy Brown, Glossy Yellow, Glossy White, Glossy Red, Gold and Glossy Chrome. Shipping: Free Flat Rate Shipping for Continental U.S. states only. For shipping to Hawaii and Alaska it is additional. Please contact us for these rates. Please do not hesitate to contact us if you have any questions or if we can do anything to make your purchase decision easier. We can build any size legs that your project requires. We also do custom work so if you have an idea send it to us and we will try to bring your vision to life. Our shop is in Rogers Arkansas, USA. We like being part of the American dream. Creating a business with small town values and employing fabricators who enjoy their work and want to come to work every day. EASY ASSEMBLY: The bracket is 5" out from the corner both ways. It is 1/8" thick and 1 ¼" wide. You will have from 10 to 18 pre-drilled holes available for attachment. The size screw needed is 1/4" or a #8. This is all it takes to attach them to your DIY top.